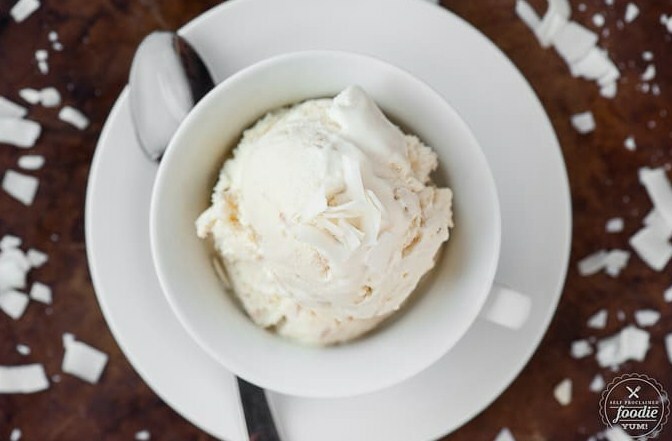 This delicious and creamy Coconut Ice Cream is made the old fashioned way with toasted coconut and both heavy cream as well as coconut cream & coconut milk. In a large bowl, whisk together the egg yolks and the sugar until light and fluffy. Set aside. Add the coconut to a medium sized heavy saucepan and set over medium-high heat. Stir the coconut until it begins to brown, about 7 minutes, but do not allow to burn. Add the half and half, heavy cream, coconut milk, and coconut cream and bring to a simmer. You want to scald the mixture without it coming to a boil. Just before it starts to boil, turn the heat off. Slowly pour the hot coconut milk mixture into the yolk mixture, starting with a small amout at first, whisking constantly. Once you've added enough to warm the egg mixture, add a little more, always whisking, until everything has been combined and well mixed. Then pour the mixture back into the pan. Set over medium-low heat and cook, stirring slowly and continuously, until the custard thickens. You know its done if you can wipe your finger across a coated spatula and it leaves a trail. This takes about 5 minutes. Do not allow the custard to boil. Pour the custard into a clean bowl and place over an ice bath to cool while occasionally stirring to mix the hot with the cool. Refrigerate the custard until cold, at least 1 hour. Transfer the custard to an ice cream maker and freeze according to the manufacturer’s instructions. Make sure your container has been frozen at least over night prior to starting. I have a Cuisinart and had to make the ice cream in two batches, one right after the other, and the mixing process took about 30-45 minutes per batch. Transfer the ice cream to a container, cover and freeze until firm, at least 4 hours. Makes about 1 quart.